I cleaned off my fridge earlier today, and was left with a pile of photographs, papers and Christmas cards that I needed to put away. While I was at it, I also decided to tackle another pile of stuff that needed filing or organizing. First I put everything on top of my kitchen table. Professional organizers call this a "staging area". Make sure you have a large, clear space to sort your stuff, or you'll get frustrated much more quickly. 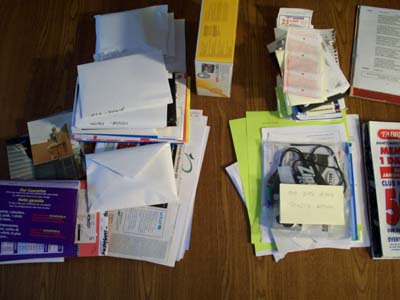 Then (and this is the easiest part), sort everything into smaller piles of similar items. WARNING: This is where most people stop. They sort their piles, and then - overwhelmed by the work involved in actually doing something with each pile - they simply re-pile everything and call it a day. Do yourself a favour, and move on to the next step in the process. My first pile of paper was a bunch of letter-sized paper that needed to be recycled - except that each page was printed on only one side, and so would be great to use for scrap paper in my printer when I'm running off rough drafts of documents. Luckily I have a spot for this kind of thing - in a magazine box near my printer, where I also store plain white paper and a specialty paper I frequently use. The second "pile" of stuff was actually just one page - a template I use when cutting out the business cards that I print myself. I have a guillotine paper cutter that gives a professional edge - but I need to know how much to cut off. This page got stored in the magazine box with the printer paper. The third pile was actually a bunch of piles of stuff that simply needed to be filed away in my filing cabinet. I have places for all of it - I was just lazy about doing the actual filing. My filing system isn't fancy. I have six deep drawers for files, and I use hanging file folders to keep things neat. Each drawer is sorted roughly by category, and within each drawer the files are organized alphabetically or by subject. Another pile - of church bulletins - needed filing. I have a bad habit of carrying church bulletins home with me rather than leaving them behind at the church. Most of them are actually headed for the blue box. Ah, Christmas cards. I actually save Christmas cards - on purpose. I reuse them in handmade cards that I sell for charity each Christmas season. I even encourage other people to give me their old cards. Cards that I'm going to reuse get their fronts torn away from the backs - I only save the fronts. They go in a file folder in one of my filing cabinets. Cards that I'm going to save because they have special notes in them go in a keepsake box. I also collect stamps for art projects; they go in another keepsake box. The keepsake boxes (as well as sewing and craft supplies) are kept in a large locker which also stores my t-shirts and sweaters, some shoes, and my yoga mats. There was a small pile of stuff that belonged in my wallet. I wasn't going to clean out my wallet at this time, but as I went to put a Starbucks gift card in one of the credit card slots, I realized I had a bunch of used-up gift cards and expired membership cards. It's a good thing I started sorting through my wallet - I also found an expired insurance card for my car. Oops! The expired cards were cut up, and the rest were sorted and put in their proper slots. My fridge is often a gallery space for drawings that I or my niece and nephew make. I have a file folder in one of my filing cabinets for small artwork like this. Dad gave me a Sudoku calendar a year or two ago, and I usually tear off a few puzzles every month or so to stick in my date book or my car to solve when I have some time to kill. 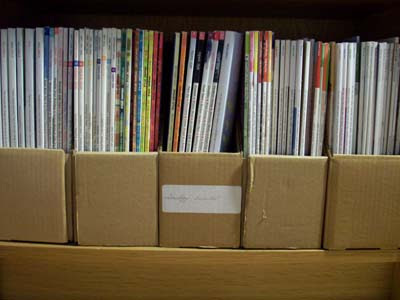 The Sudoku pad goes back where it came from, into one of the magazine boxes. I had a bunch more stuff that needed filing, as well as some papers with phone numbers and other time-sensitive info that I usually put into a spiral-bound notebook that I carry with me everywhere. 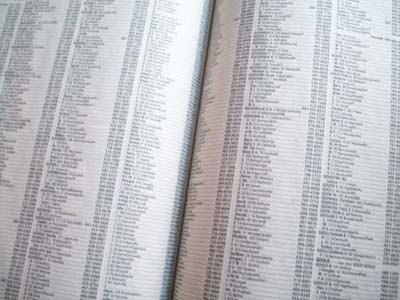 I date the pages as I write lists or staple scraps of paper into it. It's a great, centralized place to keep all those stray bits of information that I need. I should have mentioned earlier that, when working on my piles, I chose the easiest ones first and left some of the most challenging (or time-consuming) ones for last. Receipts are the bane of my existence. I have to keep many of them to claim for business expenses on my income tax, and normally I try to keep on top of them so they don't pile up. I created four new piles: bank slips, and piles of receipts for October, November and December. These piles of receipts also have a home in one of my filing cabinets - categorized by month. Sometime before I do my income tax return I'll sift through them again and weed out the ones that I don't need. I tore down the box for the Kodak (it went in my blue box), and collected into one small plastic baggie all the pertinent bits and pieces that I'm keeping. I store electronic stuff like this in a basket on one of my shelves. The other camera got put in my "holding area," where I store stuff before returning it or donating it. My biggest chore was sorting a bunch of photographs that I've had out all fall. Now that I have a digital camera, I can file these snapshots away. I have a bankers box where I keep all my photos, and it was actually less of a chore than I'd thought to quickly sort all the photos into their proper envelopes, labeling the ones that didn't yet have labels. The bankers box of photos is stored on another one of my shelves. At the end of the job I had recyclables and garbage left over. I shred anything with my name and address on it, or anything to do with my finances. *Instructions for viewing the album on Facebook: Click on the first photograph to read the description of that photo. To proceed to the next photo in the series, simply click on the current photo, or click on "Next" in top right corner of the page. so, what are michelle lynne goodfellow's specialties? The majority of my experience is with residential organizing. I got started in the field while working at my previous business, an eco-friendly home-cleaning company. Clients (particularly seniors) would ask me for advice and help with moving or downsizing, and my new business was born. I've spent several years working intimately with people in their own homes, which is possibly why I prefer residential organizing. But having been at the helm of several small businesses, I also understand the needs of the business sector - especially small office/home office setups. My background in Home Economics (B.Sc. (H.Ec.) '89 from the University of Western Ontario) has given me special insight into the design of living and working spaces, and I am currently training in a kind of bodywork called the Alexander Technique which further helps me evaluate the ergonomics of spaces. I'm also a longtime yogi and meditator, interested in helping people create calm, soothing and regenerative places in which to live and work. I have extensive experience working with seniors - they are a population that is dear to my heart. I have a lot of insight into their special needs and (I hope!) a lot of patience to deal with their fears and resistances. I also have extensive experience working with young families, meeting the needs of children as well as their working parents. I am a foodie who loves to cook and (that Home Ec. experience again!) organize a kitchen. I love the drudgework of sorting and purging a client's chaotic clutter - and being a visual artist, I have an eye for organizing things to pleasing (and functional) effect. I'm fast - in fact I often have to curb my tendency to rush - but I can slow myself down for a client who needs to take time to weigh decisions. People are often amazed at what I can help them accomplish. I especially love to educate and coach my clients in organizing strategies, and I get the most satisfaction from knowing that I've passed along useful tools that will keep clients organized long after I've left. So you're taking the plunge and hiring a professional organizer. What can you expect from him or her? For starters, nine times out of ten it's going to be a her. This is a predominantly female industry. But, providing you live in a major metropolitan area, you'll have quite a choice - everything from grandmotherly types to hip young urbanites. Some professional organizers have a strong business or administrative background, while others (like myself) are born entrepreneurs with an unconventional bent. Many organizers are very artistic or creative, believe it or not. This came as a shock to me when I first joined the Toronto Chapter of Professional Organizers in Canada (POC). I think the assumption is that organizers are very logical, left-brained thinkers - and they can be - but many of the organizers I know excel at the right-brained stuff, too. And it kind of makes sense. Organizers have to be able to see the big picture as well as the little details. We're usually excellent troubleshooters who also love the drudgery of sorting. Will your professional organizer do things just like the organizers on TV? Yes and no. Everyone has their own style - although a good organizer will be sensitive to your needs and adapt their methods to your particular situation. Hiring a professional organizer can be a huge expense, and if money is an issue, you can cut corners on supplies and billable hours. Which means you might not get the pretty storage solutions you see on TV, or the leagues of helpers waiting in the wings to clear a room in a weekend. Most organizers I know carry a small kit of "essentials" to their jobs. This can include anything from markers and labels to measuring tapes and hammers. Some go all-out and provide boxes and garbage bags for sorting and purging; others will expect you to pick up this expense. Ask ahead of time so you know what to expect. Depending on your situation, your organizer will probably suggest a plan of action that may take several organizing sessions. An individual session is usually very low-tech, especially if it's a purge: The organizer will show up in "work" (i.e. get dirty) clothes, probably wear rubber gloves (against dust - you wouldn't believe how dirty our hands get otherwise! ), and possibly don a dust mask. Purges and sorts usually make your home or office look much worse before it looks better, especially if you have a lot of clutter. 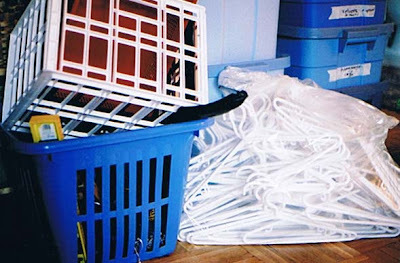 Your organizer may ask to clear a "sorting area" where you can go through your possessions together. Some organizers will cart away your "give-aways" for you, while others will expect you to dispose of things yourself. When it comes time to reorganize what you've got left, most organizers will suggest various storage options, but let you make the final decision. Some will purchase storage containers for you, and others will expect you to acquire things on your own. As you might expect, the more you ask an organizer to do, the more you will likely pay for his or her services. Give your organizer frequent feedback on how well he or she is satisfying your needs. Organizing can be a very difficult, emotional process. There will likely be tense moments. But in general things should feel like a good fit. If they don't, talk it over - and don't be afraid to hire another organizer if the first doesn't work out. Not everyone will be perfect for you. Are you inspired by reading about organizing and organization? One of my favorite books about the voluntary simplicity movement is by author Elaine St. James. In Living the Simple Life she tells the story of a family who lost their home in a fire. When the time came to begin replacing their possessions, they suddenly realized how few of their former things they really needed. They had experienced a shocking loss, yet were able to see the silver lining in their tragedy. They got a chance to start all over again, creating a life (and a home) that was a true expression of their values. If your house was on fire and you had only moments to escape, what would you take with you? Most of us have at least a few irreplaceables: photos, mementos, family heirlooms. But stop a moment and think. How important are those things, really? What I've found as I've done layer after layer of my own purging is that there is really very little that I can't live without. I'm fond of my favorite possessions, yes - but my life will not be diminished by their loss. There's something very freeing in this attitude. If my things don't matter, I can spend more energy on the stuff that does - like friendship, and joyful activities, and personal development. I moved last fall, and I've helped others move in the months since. Every time I lug a box full of stuff that I know won't get unpacked for months - if ever! - I question the sanity of our culture (and my friends and clients). Sometimes I entertain a fantasy: What if I moved to Europe? What if I couldn't take more than a couple of suitcases with me? What if I lived my life with everything I needed, packed into a carry-on bag? In my line of work I am constantly faced with the rampant consumerism and materialism of our society. Whether it's a Depression-era client who can't let go of a collection of rubber bands, or a young urban professional who can't let go of a wall full of videotapes, we are drowning in stuff, and most of us can't appreciate how meaningless are the things to which we cling. When I'm working with clients, I walk a fine line between supporting and encouraging people's passions, and really putting the screws to them as far as their clutter is concerned. The trick (or art, if you want to think of it that way) is knowing when people are ready for change, and when they just need some gentle nudging. As far as my own philosophy goes, I espouse simplicity - even austerity. The older I get, the more impatient I become with my own clutter. I spent years acquiring more and more and MORE... now my constant refrain is: How few [fill in the blank: clothes, books, CDs, etc.] can I get away with? And I have to say, each layer of my life that I shed leaves me feeling lighter and freer. There is a whole movement devoted to this. You may have heard of it: Voluntary Simplicity. One of my first introductions to the Voluntary Simplicity movement was nearly 20 years ago, through the "More with Less" books published by the Mennonite Central Committee. Living More with Less by Doris Janzen Longacre became my favorite bedtime reading one summer when I was cooking for a treeplanting camp in northern Alberta. A few years later I found Janet Luhrs' The Simple Living Guide, and it fueled my downsizing dreams for several months. Then I ran across one of Elaine St. James' books at a client's house, and there was no turning back. Simplicity means different things to different people, but at its core is the desire to lead a life that has meaning and richness, filled with connection to others and to one's own deepest desires. To live deeply implies that you spend much time on few things. Too many possessions become a distraction: They require constant attention in the form of cleaning, care, storage (or working to pay for storage), and organization. My own attempts at Voluntary Simplicity are a work in progress. If you're inspired to read more, check out the website The Smart Woman's Guide to a Simple Life by writer Gretchen Roberts. She lists many other current resources for simple living. 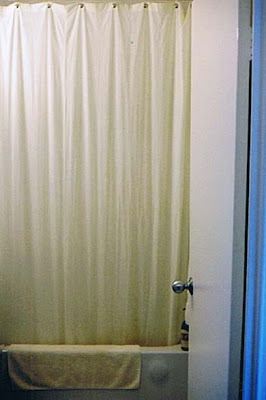 Conventional store-bought shower curtains are made from polyvinyl chloride (PVC), a petrochemical product that is toxic in its manufacture and use (it outgases a suspected carcinogen and hormone disrupter). It is being phased out of toys and household products in Europe, and hopefully North America will soon follow suit. Because it is relatively inexpensive to make, it's found in a huge variety of items. Read more about the dangers of PVC here. 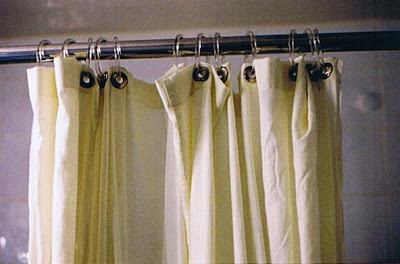 Alternatives to vinyl shower curtains are available commercially in the form of fabric curtains. Most are also made from petrochemicals, however. Hemp and organic cotton shower curtains are available, but expensive. I decided to make my own eco-friendly shower curtain out of a large piece of gauzy 100% cotton from my fabric stash. All I had to do was hem it to the appropriate length and add twelve grommets to the top. Because it's so lightweight, it dries quickly and doesn't attract mold. It's easy to wash, and can be dried by re-hanging it while still wet. It looks great in my bathroom, adding to the natural spa effect of white tiles and stainless steel fixtures combined with natural materials such as wood and wicker. So you think you need a professional organizer. How do you go about hiring one? I recently had a potential client call me; she was looking for an organizer to help her with a garage sale in the fall. She's downsizing, and wanted someone experienced in the disposal of a large number of items. She had the right idea: She did her homework ahead of time, and knew what she wanted. Evaluate your own situation. What kind of service do you need? Clients have hired me for jobs as varied as helping them sort for a downsize, helping them purge unneeded possessions, helping them rearrange an interior space or organize a specific area of their home, helping them pack and organize for a move, helping them categorize a collection, re-systematize their files and workspace, or choose storage systems. Hiring an organizer can be expensive; many organizers in the Toronto area where I work charge upwards of $50 an hour for their services. It pays to know exactly what you need. Let's say you're overwhelmed by a cluttered basement. You have boxes piled everywhere in your family room, which you'd ideally like to use as a space for relaxation and entertaining guests. Do you need help sorting through the boxes? Do you need advice on how (and where) to store the things you decide to keep? Do you know where you're going to put things? Do you know who will take the things you no longer want? Let's say you decide you need someone to help you with the sorting and purging. Do you need them to hold your hand through the entire task, or do you just want someone to jump-start the process? Are you willing to do "homework" if the organizer assigns it? Once you've defined your needs, write them down. This will help you when you begin talking to prospective organizers. Where do you look for an organizer? Start by asking friends who may have hired professional organizers themselves. Most of my colleagues get their clients through referrals and word of mouth. If you don't know anyone who's hired an organizer, check out professional organizing association websites such as Professional Organizers in Canada (POC) and the National Association of Professional Organizers (NAPO) in the US. Members of these organizations must adhere to a code of ethics, and often will have had training in professional organizing. Both sites have a "find an organizer" function which will generate a list of organizers in your area. Ask prospective organizers about their background and training. How long have they been organizing? Do they have a specific area of expertise? Do they provide references? Are they insured? How much do they charge? Is there a fee for the initial consultation? Do they have an hourly rate, or will they charge a fixed fee per project? Some organizers may ask you to sign a contract, outlining the specific work to be done and any conditions they may have regarding cancellations or payment. Some organizers may also ask permission to take "before" and "after" photos for their portfolio. Don't be afraid to assert your own needs and preferences. 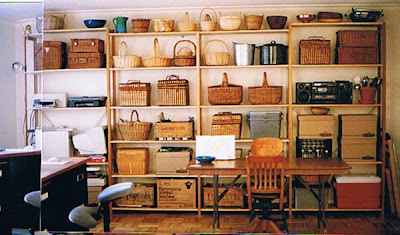 Having an organizer come into your home is a very personal and intimate experience. You may feel vulnerable about revealing your perceived disorganization. 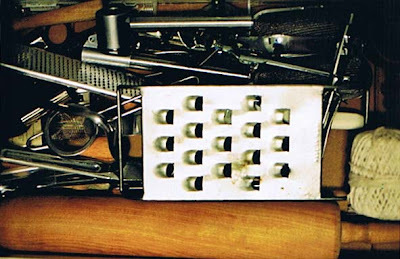 Know that most professional organizers have probably seen it all before. We are generally compassionate, caring people who delight in helping others achieve their dreams. Look for someone with whom you feel comfortable. Most organizers are committed to satisfying their clients. We want to know if you're unhappy. We'll help you find someone to meet your needs if we can't. What happened to the prospective client I mentioned at the beginning of this post? I was honest and told her I don't have a great deal of experience organizing garage sales. I know many other organizers in my city who do, so I gave her the names of two who specialize in downsizing and estates. The client was thankful for my help, and we had a lovely conversation about her situation. She hung up the phone feeling encouraged in her efforts. On Tuesday, May 1, several Toronto POC (Professional Organizers in Canada) members volunteered at a Toronto NOWeek (National Organizing Week) event, organizing a storage locker for Red Door Shelter. Red Door collects donations of used furniture and household items, and distributes these items to clients (abused women or new immigrants) who are setting up new households. The storage locker was in desperate need of organizing: it was full-to-bursting with mattresses, beds, dressers, chairs, sofas, and tables which had been piled haphazardly without any order. 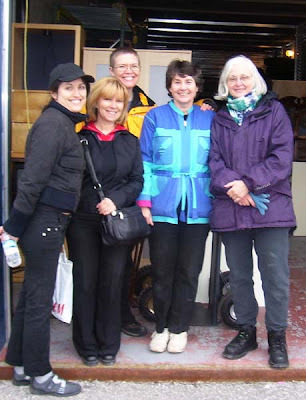 TPOC members (left to right in photo above) Aleya Gibson, Lilian O'Meara, myself, Karen Shinn, and Helen Melbourne helped Red Door staff Nancy and Iris sort and purge the inventory. Part-way through the day a scrap metal dealer named Michael Mazerolle (416-732-7910) showed up to carry away the metal trash, and happily he and his assistant were able to help us assemble some industrial shelving inside the storage locker, to hold small items like cushions and end tables. Despite the chilly weather and the occasional sprinkle of rain, we were able to complete the sort and reorganize the locker by the end of the afternoon. Red Door driver Myaya, who delivers the furniture to its new homes, was there to see the final result and was very impressed by our work! If you live in the Toronto area and have furniture to donate, Red Door picks up within the boundaries of Bathurst to the west, Highway 7 to the north, Markham Road to the east, and the lake to the south. Their contact number is: 416-915-5671 ext. 222. Please don't donate crappy stuff to charities. They probably can't use it. If you wouldn't give it to a friend, don't think that someone less fortunate than you will be happy to have it. Volunteering on a project like this with other POC members is a lot of fun! We all have different organizing styles, but it's great to see how other people work, and it's wonderful to make connections and build relationships with colleagues. Something that has stuck with me for years is cultivating an attitude of gratitude. With the recent popularity of the Law of Attraction (as explained in books such as The Secret), the value of gratitude has become even more apparent. Years ago, the best-selling author Sarah Ban Breathnach recommended keeping a gratitude journal in which to record all the things for which you are grateful. 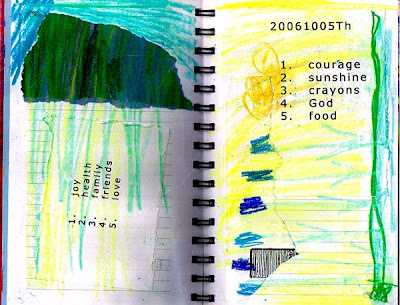 At various times I have made gratitude lists, and last fall I started an art journal dedicated to gratitude. For months I wrote in it only occasionally, but lately I have become almost obsessed with gratitude. I have so much for which to be thankful, and I love looking back over what I have written. It makes me happy. As Oprah says, "The more your praise and celebrate your life, the more there is in life to celebrate." *In fact, it was an Oprah show that originally introduced me to professional organizing, via Oprah guest Julie Morgenstern. I recently had an initial consultation with a new client who is struggling with the burden of too many tasks to accomplish. As we talked about his situation, he asked how he might begin to organize all his projects so that he can get the "big picture" and prioritize everything more effectively. I shared with him my favorite brainstorming tool: a pack of Post-it Notes. I'm very visually oriented (hence my parallel existence as a visual artist), and I like to see everything in front of me when I'm working. 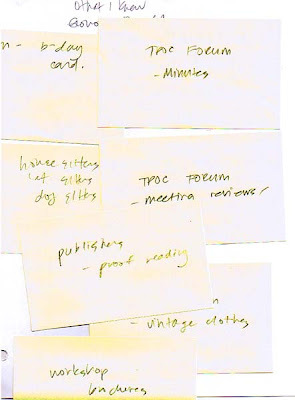 If I have a lot of ideas to organize, I sit down with some Post-its and start jotting down ideas - one item per page - then stick them to a large area like a blank wall, a door, or an empty tabletop. It's easy to move things around as patterns begin to emerge, and after about fifteen or twenty minutes I have a visual chart of the subject I'm brainstorming. I can then transcribe all the Post-it jottings as bullets in a spreadsheet or Word document, and begin formulating my action plan. My visual orientation also means that I shun PDAs, because I like to see everything all at once. If it's not on the page in front of me, I can't remember it well. If I had room to carry around a desk-blotter-sized "month-at-a-glance" calendar, I would. As it is, I make do with a "week-at-a-glance" day planner, and a monthly wall calendar for tracking my financial life (accounts payable, etc. ).